Lots of users want to be able to stream privately, either to restrict their viewers to a specific group of people or to control their viewer hour usage. IBM Watson Media offers several options for making streams private. IBM Watson Media has a platform designed specifically for the needs of broadcasters who plan on streaming to a selective and internal audience. 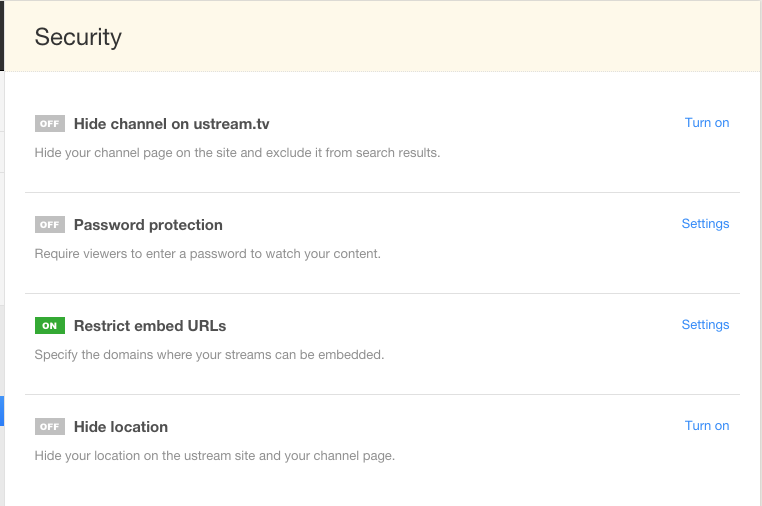 Video Streaming for Enterprise includes options for added security, requiring 2 step authentication from your users or SSO, depending on your preference. In order to sign up for an Align account or to learn more about Align, please click here. IBM Watson Media offers a combination of features for restricting viewership at the Platinum level as well. The first feature that allows this is Embed Restriction- the ability to restrict the ability to embed your channel player to just those websites that you allow. This feature by itself is available at the Gold level of Pro Broadcasting. To restrict the pages that your player can be embedded on, go to the Security tab of your Channel settings in your Dashboard. Click on 'Settings' in the Restrict embed URLs row. This will bring you to the embed restriction page, where you can whitelist the webpages that are allowed to embed your player. Please note that if you want to allow embedding anywhere across an entire domain, be sure to put the parent link with an '*' at the end of the URL- this will allow any child pages to also carry the embed. You can also determine where users who attempt to view from an unauthorized page will be sent- you can direct them to your legitimate pages, or any other page you choose. 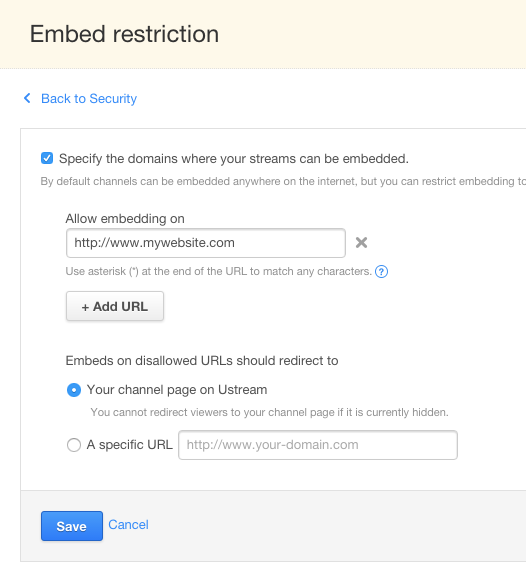 You can combine the embed restriction feature with the channel hide feature (Platinum level only) - the ability to completely remove your channel from access via search OR direct link- to ensure that all viewership of your broadcast occurs only on your own webpages. By putting your embed behind your own authentication wall, you can create a completely private stream by combining these two features.